Institute of Education Sciences summarizes the performance of U.S.
* not significantly different from 12 education systems. and use information. In 2001, the difference was 17 points. compared to the international median of 7 percent. > the international median of 41 percent. > compared to the international median of 76 percent. > participating education systems, including the United States. > For more information on PIRLS, visit http://nces.ed.gov/surveys/pirls/index.asp . Joseph Rodriguez grew up in Houston's east end in the 1970s. His family was bilingual and working class. The youngest of four children, Rodriguez was the son of a pipe fitter and a homemaker. "My parents worked hard to provide the things that we needed; there simply wasn't money for much, if anything extra," he said. But each holiday season his mother would encourage him, his brother and two sisters to write letters to Santa — in both English and Spanish. And, each year, a colorful postcard would arrive in the mail, inviting the family to pick up their holiday toys. As a child, Rodriguez never really thought about where the toys came from, never realized that the family budget didn't allow for "extras." "However, as I grew older I realized that the toys came from a community of Santa's helpers working behind the scenes very humbly, very low-key," Rodriguez said. Rodriguez and his siblings are four of the millions who have been served in the 95-year-old Goodfellows program, which Rodriguez now proudly promotes, including financially. Goodfellows, which benefits needy children ages 2 through 10, is funded by contributions from the public. All the money collected is used to buy gifts. The Houston Chronicle pays other costs. The director of the University of Houston's Language Acquisition Center, Department of Hispanic Studies and Department of Modern and Classical Languages, Rodriguez lauded the toys given by the program. "The toys are all age-appropriate and promote learning. I remember receiving books that allowed me to begin my home library, and a pogo stick," Rodriguez said, adding that he truly appreciated the effectiveness of the toys while in graduate school and studying how play impacts child development. Western-themed toys fueled his imagination and daydreams of life as a cowboy on the open range. The professor also said he has cherished memories of the entire family sitting on the floor, working puzzles. "That was the impressive thing — the toys taught problem-solving and allowed us to work together as a family," he said. Rodriguez, the founder of the East End Education Project, said he has "worked in the schools and seen the need" for the Goodfellows program. He added that his siblings also promote the program. "My eldest sister publicizes Goodfellows at her church, at school," he said. "Goodfellows gives hope to many families, helps them bring joy to children who otherwise wouldn't have as much," he said. Raymond M. Castillo, $25; Alyssa, Jordan & James McClure, $100; Michael Sorgenfrei, $150; Peggy J. Price, $25; Robert Holly, $100; Nancy Ballard, $20; George & Darlene Hirasaki, $100; Richard Scalzitti, $100. Houston Book Land Inc., $100; Peter & Nora Dorflinger, $500; Harvey Petter, $50; Thomas & Kathy Bacon, $15; Le Roy Krennerich, $25; David & Debbie Grogg, $200; Jean B. Cobb, $10; Ed and Fran Smith, $50; James & Karen Henderson, $100; Suzanne Mitchell, $100; Charles & Lou Ann Champ, $100; Marsha Montemayor, $400; Anita Handley, $200; Keith Bloom, $25; Ken & Marie Olive, $50; Polly Lee, $50; Allen K. Grady, $350. Charles Schmitz, $50; Boots & Adelle Roberts, $25; R. G. Edwards, $100; Elinor Dixon, $50; Philip Dreessen, $100; June R. Chommie, $25; Pat Whitman, $25; Joan Galfione, $50; Ray & Jerry Davis, $100; Robert Elliott, $200; Franklin Newman, $25; Charles N. Grichar, $50; Mary Elizabeth & Thomas Dawson, $100; Norman & Elizabeth Bock, $50; David Angus, $15; W. Alan Smith, $50; David & Carol Willis, $250; Jennifer & Stephen Harper, $25; Virginia Sisson, $100; Trisha Hillman, $1,000. Edward & Sharon Belcher, $150; Omar & Joan Bitar, $100; Marian W. Brown, $20; Mr. and Mrs. W. Gary Littlepage, $500; Leroy & Judy McMillin, $25; Nancy & Art Shelton, $100; D. P. Dampf, $25; Claudia Riedlinger, $100; Fairbanks Car Repair, $100; Gerald Kraynik, $150; Best Plumbing, $500; Claudia & Bob Fisher, $100; Diana & Dennis Litt, $20; Jon & Lesley Boultinghouse, $20; Ray & June Thompson, $100. Benjamin Torres, $25; John Green, $150; James & Diane Tidwell, $100; anonymous $910. Checks for tax-deductible contributions can be mailed to Goodfellows, P.O. Box 4260, Houston, TX, 77210-4260, or made online at www.chron.com/goodfellows. Contact us: Write to Goodfellows, care of the Houston Chronicle, P.O. Box 4260, Houston, TX, 77210-4260, or e-mail goodfellows@chron.com. List a street address (no post office boxes, please), including ZIP code, and the names and ages of the children ages 2 through 10. Include a daytime telephone number, if available. Applications must be in Goodfellows' hands no later than 5 p.m. Dec. 11. If applicants wish to do so, they may include a brief description of the problems that prompted them to contact Goodfellows. Collecting gifts: Families will be notified by mail with information about when and where to pick up gifts. ("Americans close the book on recreational reading,"
since 1994 is up, not down, more reading, not less. Since the list’s release, 15 schools from across the nation have been retracted, including Weslaco East High School. The nationwide study, compiled by Johns Hopkins University researchers, cited schools with poor retention rates, comparing freshmen enrollment to senior enrollment at the schools. The study surmised that comparing freshmen enrollment to senior enrollment three years later was a good way of determining whether students were dropping out, since districts count and report dropouts differently. Critics said that method was an oversimplification of the issue. In fall 2000, Weslaco East High School opened as the district’s campus for freshmen and sophomores, while Weslaco High School housed juniors and seniors. Two years later, Weslaco East began the transition to a four-year high school, welcoming classes of juniors and seniors, with Weslaco High School taking back some freshmen and sophomores. The timing of the transition created the appearance that many Weslaco East students had dropped out before reaching their senior year. In actuality, they had just transferred to the other campus. Peterson said the school contacted Johns Hopkins the day the study was released, and the correction was made about a week and a half later. Maushard said despite the corrections, the study is still overwhelmingly accurate. The subtractions from the list are just a small fraction of the 1,700 schools originally on the list. Despite Weslaco East’s removal, Peterson said the school doesn’t take the dropout issue lightly. “We are fully aware that we do not have 100 percent of our students graduating from high school and take full responsibility for this issue,” she said. ALBUQUERQUE (AP) Gabriela Dominguez wraps her arms around her cousins Adrian and Angel, encouraging them to study hard so they don't end up on Albuquerque's long list of dropouts. The boys hug and kiss her back, even though she'll be "on their case" this afternoon at Washington Middle School about homework and grades. The two 13-year-olds look up to 17-year-old Dominguez, who not only is their cousin but their mentor in ENLACE Los Companeros, a corps of volunteers who tutor and support families and children in seven Albuquerque middle and high schools. The program started nearly seven years ago in hopes of boosting high school graduation rates in areas where dropout rates historically have been high. The first ENLACE class of 215 seniors is on track to graduate in May. Through the work of tutors such as Dominguez, ENLACE has startling results to report: 97 percent of the original group of midschoolers are expected to receive diplomas from Albuquerque, West Mesa and Valley high schools. That is a phenomenal rate compared with districtwide longitudinal studies that indicate about 50 percent of ninth-graders will graduate from high school. started in the program as sixth-graders, said Antonio Gonzales, a former ENLACE mentor who keeps close tabs on the Albuquerque High group. "We've been able to grow together." Many of the ENLACE seniors will be the first in their families to get a high school diploma and enroll in college. ENLACE takes its name from Engaging Latino American Communities for Education, a partnership of the University of New Mexico and Albuquerque Public Schools to reduce the dropout rate, improve the graduation rate and get more students into college. "ENLACE is one of the cheapest and best dropout prevention programs that our state has right now," Washington principal Cynthia Challberg-Hale said. "What we are doing is actually working." ENLACE officials said the program costs $128 per student per year. In addition to Washington, ENLACE serves students at Garfield and Truman middle schools and four high schools, Albuquerque, West Mesa, Valley and Highland. The Washington program serves 45 students with college and high school tutors and mentors. Not surprisingly, there's a waiting list at Washington for ENLACE tutoring and support, Challberg-Hale said. Demographics for Washington would indicate a high dropout rate, but ENLACE students are succeeding despite poverty, language and other barriers in their lives, she said. 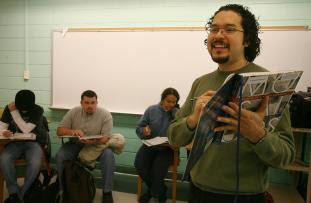 Of the original ENLACE students at Washington, 25 received intensive services, and only three of those dropped out, Gonzales said. One joined a gang and became a father; another got pregnant and didn't return to school; the third had to leave school to work to support herself, he said. Gonzales, now the Albuquerque High activities director, was among the mentors in 2000 who helped recruit senior Dominguez into ENLACE Los Companeros when she was a sixth-grader at Washington. Dominguez has come full circle at the school. She now tutors ENLACE students at Washington twice a week for high school elective credit. "I think all of this is going to help me," Dominguez said. "I want to go into teaching and counseling." Dominguez describes herself as a Mexican immigrant who struggled to learn English during third grade, her first year in the United States. "I was 9 and afraid to go to school because I didn't speak English," she said. In ENLACE, she found other Spanish-speakers who shared her fears, but the mentors helped them gain confidence, enjoy school and become bilingual, she said. They were her support system outside of school, too. At age 16, when she was told she had cancer and had a tumor removed, she cried, though not because she was sick. "I didn't want to miss school," she said. As an ENLACE mentor, she hopes Washington students will follow her example and appreciate ENLACE. "We stayed together as a family," she said of her senior classmates. "We are really close to our mentors, and we really trusted them, like they were our parents or our big brothers. But we had fun with them, and they made us do our homework." She tutors as she was tutored. "We're doing pretty much the same thing our mentors did for us," she said. "It's my turn to help." Besides help with homework, mentors plan parties and field trips for the students. They also refer families in need for counseling and other social services. At Albuquerque High, many of the ENLACE students are members of the Student Council, which Gonzales sponsors. Others are on the soccer team he coaches or serve as his office assistants. Gonzales said he has mixed emotions about their day of separation in May when they graduate. "I can't tell you how much these kids meant to me. This group will be special forever. "These kids have done extremely well. When they were in middle school, I didn't think some of them would be here," he said. After he left high school, a volunteer from Young Life, a non-denominational Christian outreach program for students, came into his blue collar Pittsburgh neighborhood. "And I saw for the first time an adult who walked their talk . . . He loved us into change," he said. "It was through that, I committed my life. He got me back in school within three months. "We can't ask our teachers to take on kids that . . . come into school angry, (without) basic needs met," Milliken said. "We can't ask our teachers to be mother, father, sister, brother, social worker." Brownsville students scored higher on the TAKS than their counterparts in other school districts on the U.S.-Mexico border and close to the statewide average, according to research findings released earlier this month by the San Antonio-based Regional Educational Laboratory-Southwest. The research report “La Frontera: Student Achievement in Texas Border and Non-Border Districts” analyzes Texas Education Agency data in an effort to show differences in student performance on the Texas Assessment of Knowledge and Skills test between border and non-border districts. It also reports how border and non-border districts differ in location, student demographics, teacher data and community economics. The report uses the TEA data warehouse for the 2005-06 school year, which shows that students in the state’s 63 border school districts, those within 20 miles of the U.S.-Mexico border, passed the TAKS in reading or English language arts and mathematics at a lower rate than their counterparts in Texas’ 908 non-border districts and 62 margin districts, those between 20 and 100 miles from the border. However, TEA figures provided by the Brownsville Independent School District for its students show them passing the TAKS at a rate close to the statewide average and above the passing rates for border districts reported by the survey. Raul Vasquez, BISD administrator for assessment, research and evaluation, said BISD’s scores show that “the capacity of students to learn is just as good on the border as it is anywhere else in Texas. “There’s this misconception that if you’re on the border you’re going to have problems, that the farther you are from the border, the better off you are,” Vasquez said. “This town sits right here next to Mexico, and yet the scores show that in almost all cases we’re at or above the state standard,” he said. The report gives average percentage passing figures in third, fifth, eighth and 11th grades. In third grade, 84.5 percent of border students passed the the reading or English language arts portion of the TAKS administered in spring 2006, compared to 87.4 percent in margin districts, 89.3 percent in nonborder districts and 88.9 percent statewide. In math, the figure was 74.8 percent passing for the border, 76.2 percent in margin districts, 81.6 percent in nonborder districts and an 80.8 percent statewide average. By comparison, 93.8 percent of BISD third-graders passed the reading/English language arts and 78.2 percent passed the math portion of the TAKS. By the 11th grade, the figure was 84.2 percent for the border in reading/English language arts compared to to 87.1 percent for margin districts, 89.1 percent for non-border districts and 88.5 statewide. For BISD, the passing rate was 85.3 percent. In math, the 11th-grade figure was 72.1 percent passing for the border, 76.1 percent in margin districts, 79.8 percent in nonborder districts and a 79.1 percent statewide average. BISD’s passing rate was 76 percent. The survey also found that despite perceptions to the contrary, average base teacher salaries are somewhat higher along the border across all experience categories. “This is significant because (earlier data) indicated that the leaders in border districts thought that their region offered uncompetitive salaries that posed a barrier to teacher recruitment,” the report stated. The survey shows a $32,084 average annual salary for new teachers in the border districts, compared to $29,444 in margin districts, $29,458 in nonborder districts and a statewide average of $29,623. BISD’s teacher salary schedule for the current school year begins at $38,000 annually for a teacher with a bachelor’s degree and no experience and rises based on experience and education to peak at $60,470 for a teacher with 27 years of experience and a doctoral degree. Teacher salaries may have been lower on the border at one time but that’s certainly not the case now, said Susan Fox, BISD’S assistant superintendent for human resources. “We’ve just finished our fall recruiting drive and we’ve gotten to where we do it like the chamber of commerce does recruiting businesses,” Fox said. “Like the beach? Come and teach” is the slogan. Fox said BISD employs a large number of Hispanic teachers, a predictable finding reported by the survey for all border districts. The education schools at The University of Texas at Brownsville and Texas Southmost College and the University of Texas-Pan American supply most of those teachers, who work mainly in the primary grades where a large number of students are still learning English. The survey reports a 15 percent turnover rate for teachers in border districts, 18.1 percent for margin districts, 16.4 percent for nonborder districts and a statewide average of 16.4 percent. Fox said BISD’s teacher turnover rate was 6 percent for the year reported in the survey, 2005-06. The Juvenile Justice and Delinquency Prevention Act of 1974 created a far-sighted partnership between the federal government and the states that agreed to remake often barbaric juvenile justice systems in exchange for federal aid. Unfortunately, those gains have been steadily rolled back since the 1990s when states began sending ever larger numbers of juveniles to adult jails — where they face a high risk of being battered, raped or pushed to suicide. The act is due to be reauthorized this year, and Congress needs to use that opportunity to reverse this destructive trend. As incredible as it seems, many states regard a child as young as 10 as competent to stand trial in juvenile court. More than 40 states regard children as young as 14 as “of age” and old enough to stand trial in adult court. The scope of the problem is laid out in a new report entitled Jailing Juveniles from the Campaign for Youth Justice, an advocacy group based in Washington. Statistics are notoriously hard to get, but perhaps as many as 150,000 young people under the age of 18 are incarcerated in adult jails in any given year. As many as half of the young people who are transferred to the adult system are never convicted as adults. Many are never convicted at all. By the time the process has run its course, however, one in five of these young people will have spent more than six months in adult jails. Some jails try to protect young inmates by placing them in isolation, where they are locked in small cells for 23 hours a day. This worsens mental disorders. The study says that young people are 36 times more likely to commit suicide in an adult jail than in a juvenile facility. Young people who survive adult jail too often return home as damaged and dangerous people. Studies show that they are far more likely to commit violent crimes — and to end up back inside — than those who are handled through the juvenile courts. The rush to criminalize children has set the country on a dangerous path. Congress must now reshape the Juvenile Justice and Delinquency Prevention Act so that it provides the states with the money and the expertise they need to develop more enlightened juvenile justice policies. For starters, it should rewrite the law to prohibit the confinement of children in adult jails. Focus on a state racial gap ignores some of the nation's worst overall test scores. State schools Supt. Jack O'Connell hosted a summit in Sacramento last week of 4,000 educators, policymakers and experts. He asked them to confront California's "racial achievement gap" -- the persistently lower test scores of California's African American and Latino public school students compared with their white and Asian peers. In 125 packed sessions, participants probed causes of the gap and offered strategies to close it. O'Connell asked them to "honestly and courageously face this pernicious problem," and for two days, the capital was abuzz with ideas, energy and even some hope. Strikingly, the state's other "achievement gap" was barely mentioned at the summit; this is the gap between California and the rest of the nation. For example, for years, people have been describing and lamenting California's general decline in education. We've all heard it. Test scores of California's Latino and African American students are, on average, among the lowest in the country. However, white students don't do well either, and by a wide margin: California's white eighth-graders score below white eighth-graders in every state but West Virginia and Nevada on the NAEP reading test. In other subjects and at other grades, California's white students score below white students in most other states. Is there a problem with California's white students? Do they or their parents care less about education than white students in Connecticut or Iowa? No one asks these questions about white students. Yet many people have no qualms about offering "culture" or "family background" as the main reason for the underperformance of Latino and African American students. In a report released this month by UCLA's Institute for Democracy, Education, and Access, we offer a different explanation, one that covers the learning problems of minority students and white students, which we call the "opportunity gap." What this means is that California is significantly behind most other states in providing fundamental learning opportunities, period. Conditions here are bad for all students on average, no matter their race or ethnicity, and on top of that, they are worse for African American and Latino students. Yet these are problems that are readily identified and fixable. On average, California middle and high school teachers are responsible for almost 50% more students than teachers across the nation. California has a critical shortage of well-trained math teachers even as it expects students to meet math curriculum standards that are among the highest in the country. And when students are struggling, they are unlikely to get help. Public high school students lack sufficient access to counselors -- on average, there is one counselor for every 556 students, the lowest ratio in the nation. Our middle school students have even less access to counselors, with one for every 753 students. In addition, middle and high schools enrolling the highest proportion of Latino and African American students are far more likely to be overcrowded or lack college prep courses than majority white and Asian schools. Middle schools serving more than 90% Latino and African American students are 22 times more likely than majority white and Asian schools to experience a severe shortage of qualified teachers. California's educational standards were designed to produce a highly educated workforce for a technology-based economy and a well-informed citizenry. But achieving these standards is not a simple matter of motivating teachers, students and parents to "try harder." California has not invested in its schools at a level commensurate with its standards, and our core educational infrastructure is incapable of providing the opportunities these goals demand. Truly closing the racial achievement gap and the national achievement gap will require directing new resources to those students who are most deprived of fundamental learning opportunities. John Rogers and Jeannie Oakes are the co-directors of UCLA's Institute for Democracy, Education, and Access. This speech seeks to answer these and other questions about the relationship between the economic policies promoted by the U.S. in Mexico and other developing countries, and the second-class status of migrants in the U.S. So what will go down in the Valley? By BALTAZAR ARISPE y ACEVEDO Jr. The Rio Grande Valley comprises the counties of Cameron, Hidalgo, Starr and Willacy -- roughly the size of New Hampshire and Vermont combined. These four counties make up one of the most economically and socially disenfranchised regions in not only Texas but the whole United States. Former Texas Comptroller John Sharpe said in 1998: "If South Texas was the fifty-first state, it would rank last in all social indices." It also is my area of research. It is a region ignored by both Washington and Austin, an incubator that provides a regressive environment for its population -- 90 percent of which are Mexican-Americans who are related by one or two degrees of sanguinity from relatives in Mexico. The population also is one that, according to regional scholars such as Chad Richardson and Rosalva Resendiz of the University of Texas-Pan American, uses Spanish as the primary language in its social, cultural, political and economic interactions. This reliance on Spanish might be a curse and a blessing to this population -- a curse in that it curtails the ability to fully benefit from educational development and economic resources in the region, and a blessing in that it provides for a connectivity that reinforces cultural and linguistic heritage along a border that runs more than 750 miles from Brownsville to El Paso. The challenges are similar to those that Douglas J. Besharov of the University of Maryland's School of Public Policy addressed at a macro level for Hispanic immigrants in the United States in a recent article in The New York Times headlined "The Rio Grande Rises." Besharov focused on the economic development of the immigrant Hispanic community but never intended to touch base with the region between northern Mexico and the southwestern United States. According to the Intercultural Development Research Association, there is a cumulative 46 percent dropout rate in the region's public schools; 62 percent of children have no health insurance and might have even more limited access to health resources as a result of the president's veto of the SCHIP legislation. A continuing economic impediment is that the region's median income is, on average, 35 percent below the median of $37,000 for the balance of Texas as reported by the Texas comptroller's office. All of this activity falls within an inordinate demographic growth that is, according to the U.S. Census Bureau, at a minimum of 13 percent above the national rate. And the bureau also reported a 34 percent cumulative poverty rate for the region in its American Community Survey of 2002. Something is out of balance here, and it requires the attention of government in Washington and Austin. The area is bedeviled by a misguided and ill-advised immigration policy. The region resembles a martial state. Of 13,000 border agents (the "Greenies," as they are called here), 85 percent are assigned to posts along the U.S. border with Mexico, and the balance to the Canadian border and other ports of entry. Additionally, there are plans to build a wall to separate and protect the region's Mexican-Americans from a mirror-image population on the south side of the Rio Grande. Of course, none of the Homeland Security policy wunderkinder seem to recall that the only potential terrorist entries to the United States that the American people know about were via the Canadian border. Did the Great Wall of China keep out the Mongol invaders? Did the Berlin Wall keep communism intact? Are such barriers in Israel engendering good will between the Jewish and Arab communities? Another continuing and debilitating situation is the erosion of the environment and physical infrastructure brought on by the expanded land traffic resulting from the North American Free Trade Agreement. What are some possible policy actions to be considered? First, the policy brokers in Washington and Austin need to make better use of mid-decade census data and stop relying on the old 2000 census data to guide their thinking. That is akin to keeping a milk carton in your refrigerator way past the expiration date. Second, it is time to realize that the future of Texas, as noted by state demographer Steven Murdock, is linked to the continued development of the educational and economic capacity and welfare of its Mexican-American community. According to the U.S. Census Bureau, this population is on average seven to eight years younger than the majority population and will account for 60 percent of all public school enrollments in Texas by the fall of 2008. It is not difficult to discern that this group will represent the majority of Texas' employees, military personnel, taxpayers and Social Security contributors. The continued regression of this population, as a result of inadequate knowledge capital, will hurt the greater society and its continued welfare. The corresponding challenge to the majority stakeholders is how to maximize the potential of Mexican-Americans to be fully engaged in the state's economy. Further, the Rio Grande Valley is the nexus for the balance of our nation's Latin American foreign policy. If we cannot devise a reasonable immigration policy, where will we ground our relationships with the balance of the Western Hemisphere? The Rio Grande will indeed rise as more stress is placed on this region as it attempts to respond to its challenges while swimming against the bad policy streams that originate in Washington and Austin. This region links the futures of the United States and Mexico -- but it cannot and will not fulfill its potential in its current state of disenfranchisement. Baltazar Arispe y Acevedo Jr., Ph.D., is a professor of educational administration and research director of the Center for Applied Research in Education in the College of Education at the University of Texas-Pan American, Edinburg. Congress hoped that if it required the states to give annual tests in return for federal education aid, state politicians would be encouraged — or at least embarrassed — into improving dismal schools and closing the achievement gap between rich and poor children. That’s not how things have worked out. Many states have gamed the system — and misled voters — devising weak tests, setting low passing scores or changing tests from year to year to prevent accurate comparisons over time. The charade will continue, and children will continue to be shortchanged, until the country develops a rigorous national test keyed to national standards. This problem is highlighted in a recent study by Policy Analysis for California Education, a research center run by Stanford University and the University of California, that analyzed the testing practices of a dozen states between 1992 and 2006. States that performed swimmingly on their own weak math and reading tests tended to score dismally on the more rigorous federal National Assessment of Educational Progress, often referred to as NAEP. In nearly all of the states studied, students did noticeably worse on federal tests than on state tests. In Oklahoma, the gap in scores was a shocking 60 percentage points in math and 51 percentage points in reading. In Texas, that gap was 52 percentage points in math and 56 points in reading. The state that came closest to the federal standard was Massachusetts, where there was a modest 1 percent gap in math and 10 percent gap in reading. New York was not included in this study. But the same issue emerged here earlier this month when NAEP scores for the state’s students turned out to be strikingly lower than scores achieved on the state-level test. Advocates of the mediocre status quo will oppose any requirement for a national test. Congress could get the process started by instructing the NAEP board, an independent body created by the federal government, to create a rigorous, high-quality test and offer it to the states free — if they use federal scoring standards. Congress might push things further if it published a list of states that still insisted on using their own weaker tests. Americans need an accurate picture of how this country’s students are doing. seats in the classrooms of elite colleges and universities. and each has much to say about what is wrong with college admissions. Court's 2003 decisions in cases involving the University of Michigan. group did such a thing, it raises important legal and ethical questions. justification, Schmidt's claim is an astonishing one. preferences, institutions should take great care not to do harm. students, of all races, are shut out. The Power of Privilege (Stanford University Press, 2007), by Joseph A.
relationship between body type and ability. because all applicants are highly qualified academically. in an association for the reproduction of educational privilege." challenges common to their social and economic backgrounds. merely a measure of selectivity not educational excellence of any kind. National Defense Student Loan debt (a precursor to the Perkins Loan). worth of scholarships, grants, or loans. don't remember seeing any distinction drawn between a "privileged"
were consistent with the ACT and SAT scores submitted by those students. that matter in admissions decisions. two independent variables, and that is how they are commonly used. more valid and reliable replacement is the hard part. what the authors say about college-admissions testing is off-base. speech by then-president of the University of California, Richard C.
reflect what a student can do with what he or she has been taught. black America" could have added controversial but important insights. differences in college-going rates better than admissions policies do? studying while in high school? Listening to music? Watching television? represent evidently feel no other institution can sustain their dreams. a few institutions are worthy of attending? I wish I knew. four of those authors had spent a little more energy saying that. for a lower portion of total revenue that supports our institutions. of the University of Texas." faculty members and administrators tell me that we've made "no progress"
millions of us, social mobility is alive and well in capitalist America. Democrats, Republicans and teachers see flaws in Calif.'s Rep. Miller's proposal to renew the 2001 education law. He's not giving up. WASHINGTON — Rep. George Miller (D-Martinez) has never been one to back away from a brawl -- he once warned an adversary that if he wanted to fight, it was going to take a while, so he'd better bring lunch. But as Miller pushes to renew the landmark education law known as No Child Left Behind, he faces so many fights that the fate of the bill is increasingly in doubt. As chairman of the House Education and Labor Committee, Miller is sparring with Republicans who see his proposed changes as an unacceptable watering down of the law's core standards. Teachers object to his proposal to link pay to performance. Even his fellow Democrats -- particularly freshmen who campaigned against it and members of the Congressional Black Caucus -- are giving him a hard time, largely for not doing enough to soften the law's most rigid requirements. Some critics of the law say the emphasis on math and English testing has squeezed teaching time for history, science and other subjects. Others say that the law is too strict and punishes schools that are doing a fairly good job. "People have a very strong sense that the No Child Left Behind Act is not fair, that it is not flexible and that it is not funded," Miller said in a recent speech. "And they are not wrong. The question is what we are going to do next." The 2001 law, President Bush's hallmark domestic achievement, is supposed to be renewed every five years, although it remains in effect even if lawmakers fail to do that. Democrats pledged to rewrite it this year, but time is short and political tensions are high. Congress plans to adjourn for the year in a few weeks. And some Democrats are loath to give Bush a victory on No Child Left Behind when he refused to compromise on the Iraq war. The administration has also made clear it wants just minimal changes. No Child Left Behind was designed to end what the president called the "soft bigotry of low expectations" by forcing schools to track data on low-income and minority students and holding the schools accountable if those pupils did not do well. Schools also have to show that all students are making adequate yearly progress in math and English, or face tough sanctions. Miller drafted 1,036 pages of proposed changes with the committee's lead Republican, Rep. Howard P. "Buck" McKeon of Santa Clarita. But as Miller has tweaked that proposal to appeal to Democrats and teachers, he has lost Republicans. The balance he seeks is between those who think the law's standards are too rigid and those who want them as tightly defined as possible. A 33-year veteran of the House, Miller is known for his pragmatism, his ability to make a deal and his close ties to Speaker Nancy Pelosi (D-San Francisco), all of which may help him find an answer in the few weeks he has left. "We're certainly not in full agreement," Miller said, mentioning talks with committee Republicans. "Not between my caucus and their caucus, not between Mr. McKeon and myself. Whether we can reach an agreement remains to be seen. We're pushing as hard as we can." McKeon said he was hopeful that he and Miller could reach a compromise, but he expressed concern "that some provisions in the draft would weaken accountability, allowing schools to mask a lack of achievement in the fundamentals of reading and math and obscure the information provided to schools and communities." For Miller, who has made children a focus of his career and has long advocated greater teacher accountability, working on the first No Child Left Behind bill was a natural cause. A staunch liberal, he was an odd partner for Bush, but they worked closely enough for the president to dub the burly former football player "Big George." In the five years since Miller and Sen. Edward M. Kennedy (D-Mass.) helped write and pass No Child Left Behind, they complain, the administration has never fully funded the law in a way that would help schools meet their additional burdens. Republicans counter that few laws are fully funded. The law has frustrated some parents and teachers who dislike its effect in local schools. Rep. Albert R. Wynn (D-Md. ), a member of the Congressional Black Caucus, has told Miller that his draft continues to overemphasize standardized tests. The cost, Wynn says, includes "extraordinary pressure placed on students and the loss of important instruction in music, art and other elements of a well-rounded education." Some critics say that too many schools are sanctioned under the law. Schools that fail to meet goals for three years must offer students free tutoring or the chance to switch schools. After five years of failure, the law mandates, a school must be restructured with a new staff or new leadership or be converted to a charter school. Miller's draft bill would broaden measurements of students and schools -- for instance, letting states measure how much students improve over a year and not just whether they meet the bar set by No Child Left Behind. Miller also wants to expand the standards by which schools are judged beyond math and English scores -- a shift McKeon strongly opposes. Under Miller's proposal, up to 15% of an elementary school's evaluation could be based on assessments of history, science, and civics and government classes. For high schools, rates for graduation, dropouts, attendance and college enrollment could be considered too. Some of the strictest sanctions would be relaxed under Miller's bill. For example, it would loosen a rule that puts an otherwise successful school on probation if a small group within it -- such as learning-disabled children -- fails to meet the standards. The draft would also change the way English-language learners are evaluated, allowing them to be tested in their native language for up to five years instead of the current three years, and permitting a two-year extension for some. Republicans say this would mean a child who spoke no English could enter the public school system in fifth grade and graduate from high school without ever being evaluated in English. Teachers unions have objected to Miller's proposal to allow high-needs school districts to give $10,000 bonuses to outstanding teachers and up to $12,500 for teachers of math, science, special education and other subjects that are short of instructors. Criteria for the awards would be developed with input from the unions. Critics of the unions say teachers are trying to avoid accountability. The unions say Miller's plan -- which McKeon backs -- is not workable. "You can be a better teacher than I am, but based on conditions that you have to work in, it makes it much more difficult for you to do the same job," said National Education Assn. President Reginald Weaver. "Plus, paying teachers based on student performance hasn't really made a difference in how students achieve." In the Senate, Democrats and Republicans are in talks about the bill, and Kennedy hopes to begin formal discussions in the education committee in the next few weeks. Miller, meanwhile, continues to search for a compromise that can win enough support to pass the House. "We would be wrong to waver when it comes to the existing goals and standards of the No Child Left Behind law," he said. "We would also be wrong if we failed to respond to the serious concerns with the law raised by people who sincerely care about America's educational future." WASHINGTON — About one-fifth of schools in the nation's poorest communities were flagged as poor performers last year, and more are expected to make the list as a 2014 performance deadline approaches under the federal No Child Left Behind law. The number of high-poverty, or Title I schools identified as "needing improvement" last year rose in 26 states and the District of Columbia, according to federal education statistics recently obtained by Gannett News Service. Experts predict thousands more schools nationwide will stumble unless Congress changes the law's emphasis on test score proficiency as the sole way to measure a school's worth. No Child Left Behind requires every student — whether low-income, disabled or non-English speaking — to pass grade-level math and reading tests by 2014. School officials say that's an impossible standard to meet because children vary in ability and background and there always will be some who struggle. Without greater flexibility to measure student growth, thousands more schools will be labeled as failing even if 99 percent of the kids at each school score well on standardized tests, they say. "If we allow that to happen, we'll have a revolt in our nation," said schools Superintendent Jack Dale in Fairfax County, Va. Signed by President Bush in 2002, the No Child Left Behind law requires states to test students on math and reading in grades three through eight and once in high school. Schools not only have to meet overall achievement goals set by their state, they also must show that students in certain subgroups — those who are black, enrolled in special education classes or non-English-speaking, for example — are making adequate progress. If enough students in any subgroup don't score at grade level for two consecutive years, the school gets flagged. There are more than 51,000 high-poverty — or Title I — schools in the country. According to the Education Department statistics, about 10,700 of those schools, or 21 percent, failed to meet the No Child Left Behind standard last year. That's up about 8 percent from the year before. Students at schools that have not made adequate progress for at least two consecutive years are permitted to transfer to a better school. If a school falls short for at least three years in a row, students there qualify for free after-school tutoring. Some Title I schools face closure or removal of staff if student scores don't improve over time. In three states — Florida, Hawaii and Nevada — more than half the Title I schools were identified as below standard last year, according to the federal education statistics. But experts say that doesn't mean those schools are inferior to schools in other states. It may simply mean those states hold schools to a higher standard. Differences in state standards and the huge diversity in student populations make it difficult to compare states based on percentages of schools that miss the mark, said Jack Jennings, president of the Center on Education Policy, a Washington-based think tank. "The simple answer is to go to national standards and national tests, but the solution to one problem creates other problems," he said. "And the problem with national standards is: Who sets the standards?" Congress is considering proposals to soften sanctions imposed on schools that miss the mark for one or two student groups. Its students, as a whole, fall short of targets on state math and reading tests. Individual subsets of students fall short. Those subsets consist of students who, for example, are low-income, don't speak English as a first language, have disabilities or belong to a distinct racial or ethnic group. More than 5 percent of students eligible to take the tests fail to do so. Susan Graham has taught family and consumer science (formerly "home ec") for 25 years. She is a National Board-certified teacher, a former regional Virginia teacher of the year, and a Fellow of the Teacher Leaders Network. She invites readers to pull a chair up to her virtual table as she offers her voice-of-experience perspective on teaching today, with a special focus on teacher leadership and continuous professional growth. Harry Potter, James Patterson and Oprah Winfrey’s book club aside, Americans — particularly young Americans — appear to be reading less for fun, and as that happens, their reading test scores are declining. At the same time, performance in other academic disciplines like math and science is dipping for students whose access to books is limited, and employers are rating workers deficient in basic writing skills. That is the message of a new report being released today by the National Endowment for the Arts, based on an analysis of data from about two dozen studies from the federal Education and Labor Departments and the Census Bureau as well as other academic, foundation and business surveys. After its 2004 report, “Reading at Risk,” which found that fewer than half of Americans over 18 read novels, short stories, plays or poetry, the endowment sought to collect more comprehensive data to build a picture of the role of all reading, including nonfiction. Among the findings is that although reading scores among elementary school students have been improving, scores are flat among middle school students and slightly declining among high school seniors. These trends are concurrent with a falloff in daily pleasure reading among young people as they progress from elementary to high school, a drop that appears to continue once they enter college. The data also showed that students who read for fun nearly every day performed better on reading tests than those who reported reading never or hardly at all. The study also examined results from reading tests administered to adults and found a similar trend: The percentage of adults who are proficient in reading prose has fallen at the same time that the proportion of people who read regularly for pleasure has declined. Three years ago “Reading at Risk,” which was based on a study by the Census Bureau in 2002, provoked a debate among academics, publishers and others, some of whom argued that the report defined reading too narrowly by focusing on fiction, poetry and drama. Others argued that there had not been as much of a decline in reading as the report suggested. This time the endowment did not limit its analysis to so-called literary reading. It selected studies that asked questions about “reading for fun” or “time spent reading for pleasure,” saying that this could refer to a range of reading materials. In seeking to detail the consequences of a decline in reading, the study showed that reading appeared to correlate with other academic achievement. In examining the average 2005 math scores of 12th graders who lived in homes with fewer than 10 books, an analysis of federal Education Department statistics found that those students scored much lower than those who lived in homes with more than 100 books. Although some of those results could be attributed to income gaps, Mr. Iyengar noted that students who lived in homes with more than 100 books but whose parents only completed high school scored higher on math tests than those students whose parents held college degrees (and were therefore likely to earn higher incomes) but who lived in homes with fewer than 10 books. The new report also looked at data from the workplace, including a survey that showed nearly three-quarters of employers who were polled rated “reading comprehension” as “very important” for workers with two-year college degrees, and nearly 90 percent of employers said so for graduates of four-year colleges. Better reading skills were also correlated with higher income. In an analysis of Education Department statistics looking at eight weekly income brackets, the data showed that 7 percent of full-time workers who scored at levels deemed “below basic” on reading tests earned $850 to $1,149 a week, the fourth-highest income bracket, while 20 percent of workers who had scored at reading levels deemed “proficient” earned such wages. The new report is likely to provoke as much debate as the previous one. Stephen Krashen, a professor emeritus of education at the University of Southern California, said that based on his analysis of other data, reading was not on the decline. He added that the endowment appeared to be exaggerating the decline in reading scores and said that according to federal education statistics, the bulk of decreases in 12th-grade reading scores had occurred in the early 1990s, and that compared with 1994 average reading scores in 2005 were only one point lower. Mayors from many of California's largest cities have formed the California Mayors' Education Roundtable with the purpose of addressing education and youth- related issues that confront our cities and the state.The Roundtable has been made possible with support from The James Irvine Foundation. Mayors are held responsible for the health, safety, economy, and education of their cities whether or not they have legal authority or responsibility for these areas. The time is appropriate for mayors to join with the leaders of education systems in their cities and the state to help improve the lives of the children. We have come together because the educational needs of our children and youth are not being adequately met.Meeting the educational and social needs of our children and youth is more than just a school issue. Mayors need to take an active role in state and local conversations as new policies, programs, and practices are discussed and developed. The current conversation about improving education has not addressed the broader issues that affect our youth, and their attendance and performance in school. From our perspective, the focus has been too narrow to successfully improve education in our cities and the state.The vision for education in this state must be expanded beyond a goal of improving test scores of children in K-12 to increasing educational attainment, and providing integrated and comprehensive support for youth. We need to examine the policy barriers-legislation, rules, guidelines and practices-that prevent flexibility in the use of state and local funds to address the needs of our children and youth; increase the capacity of cities to address their needs; link funds and programs across agencies and authorities; and encourage partnerships, joint ventures, and working relationships between and among agencies and organizations. * Enabling mayors to implement comprehensive youth support programs and systems in conjunction with school and county services to address the social and safety problems confronting our urban centers. We therefore call for reframing the vision for educational and school improvement in ways that acknowledge that if students are to be successful in education and the workplace a more comprehensive set of policies, programs, services and practices need to be put into place.Our focus at the Mayors' Roundtable will be to work together within and across cities as well as with state leaders to achieve these goals. What's Going on with High School Dropouts?